Welcome to part two of my McArthurGlen Style Challenge series, where, for the next three posts I will be showing you how to style these lovely floral print Ray Ban Wayfarer Sunglasses. In case you haven't seen my past three posts (check them out here), to celebrate the Fashion Fling fortnight at outlets up and down the country, McArthurGlen has challenged a few bloggers to put together six outfits, styling two key Spring/Summer accessories for three different occasions. With Coachella under way in the States, this outfit was inspired by festival fashion. It's still a little bit cold and dreary over here to be parading around with bare legs, but as soon as festival season hits the UK, I would rock this look without the tights. This very loosely knitted Mina jumper is airy yet still provides a little bit of warmth which is perfect for Spring. And if you're like me and love a dark, grungy outfit, you can always use accessories to brighten up your outfit. 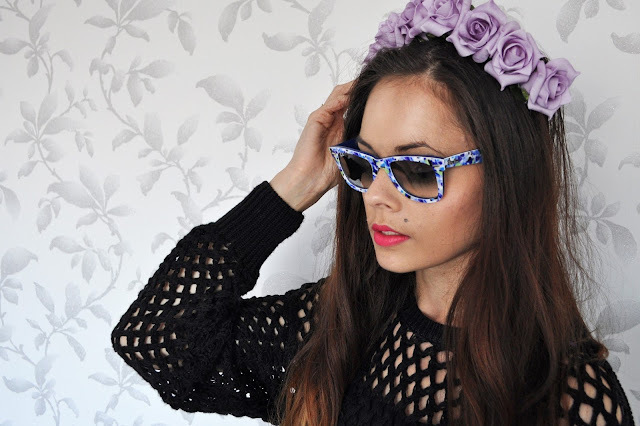 My floral Wayfarers, bright pink lipstick and lilac rose crown add a fun pop of colour and give this outfit a whole new look. Love your flower crown!the color is gorgeous! That crown and glory head piece is absolutely gorgeous, deeefinitely picking one up for the festival season! I am loving this outfit! I think it's my favourite of the fashion fling posts, I'm a huge fan of black and your accessories really stand out! This is my ideal shopping outfit!